Anyone looking at the official websites of the Environmental Protection Agency, the Department of Energy, or the White House might be under the impression that climate change isn’t a threat. That’s because the Trump administration has been systematically scrubbing its online references to climate change, according to a report released Wednesday by the Environmental Data and Governance Initiative, a group of international scientists and nongovernmental organizations. While climate change data sets and documents are still publicly available, the report details how federal agencies removed links to these documents from their web pages, deleted entire sites, and altered language to erase or downplay climate change. In fact, the Environmental Data and Governance Initiative started monitoring thousands of federal websites and downloading national scientific data after Donald Trump was elected out of concern that scientific information might disappear or be altered. The 51-page report compares climate change messaging on federal websites from before and after the Trump administration to show what’s changed. We pulled out some of the most notable edits. The Trump administration has cut down the most references to climate change on the EPA’s website. For example, the EPA removed over 200 climate web pages listing resources for states and tribes almost immediately after Trump took office, according to the report. That includes all mention of initiatives aimed at helping cities and states prepare for the devastating effects of climate change, such as President Obama’s Climate Action Plan. Under President Obama, the Office of Science, Technology, and Policy had listed a series of government-funded initiatives for “combating climate change,” which had a section on the web page dedicated solely to climate change. But since the change in administrations, the agency has yet to rebuild its site — in large part because Trump still hasn’t appointed a science adviser to the White House yet. The Trump administration delayed updating many other key White House webpages, notably the President’s “Energy and Environment” page, which had provided information on climate change and government initiatives. Under Trump, the page, redesigned in December 2017, now makes no mention of U.S. policies or initiatives to mitigate or adapt to climate change. 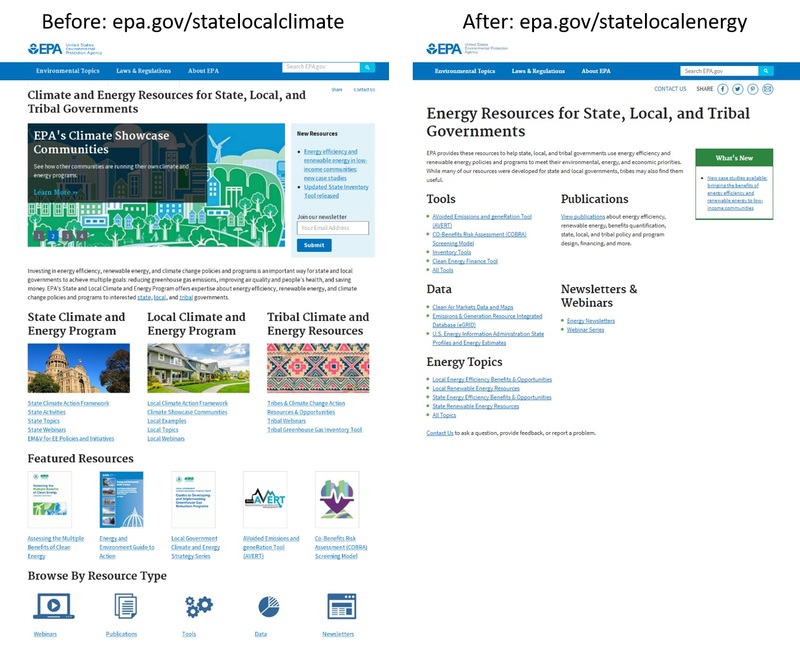 On the Department of Energy’s website, mentions of “clean energy” and descriptions of the environmental impacts of fossil fuels were also deleted. The State Department's Office of Global Change, responsible for representing the U.S. at international climate change negotiations, was previously a resource for accessing taxpayer-funded reports on climate change, such as the “Climate Action Report.” Under Trump, those reports old URLs don’t redirect to the pages’ new URLs, making it much more difficult to access them. As part of the the United Nations Framework Convention on Climate Change, the largest international treaty on climate change, the U.S. had agreed to publicize these reports to make national initiatives to reduce carbon emissions transparent to the public. Taken as a whole, these changes reshape the public’s understanding of climate change and ability to react to a phenomena that at least 97 percent of all scientists agree is happening. Critics also worry that this will influence scientist’s ability and desire to study climate change. Still, it’s hard to determine how intentional the censorship has been and where the mandate to remove information is coming from. There’s a chance poor website management or self-censorship by officers at agencies — who want to protect their jobs in an administration that’s taking the opposite stance on the climate — are to blame. Defenders of the changes, however, have said they simply reflect the government’s new policies and priorities.